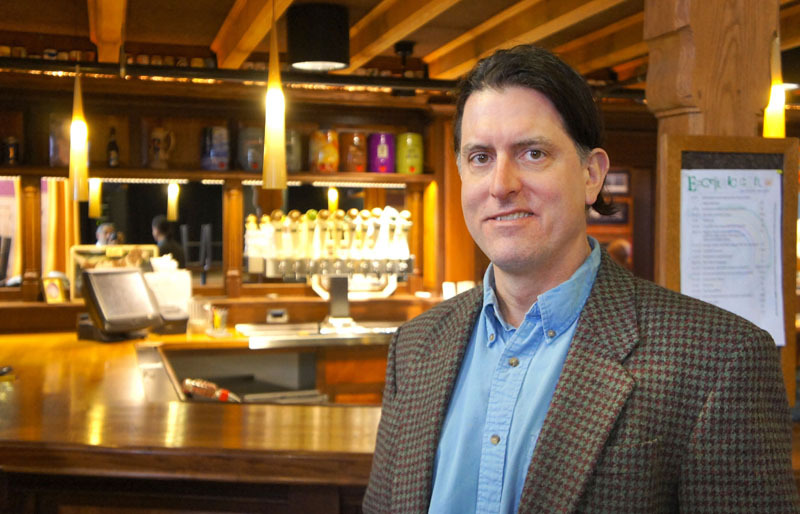 As a professional brewer going on 30 years, John Mallett of Bell’s Brewery has often been referred to as “a brewer’s brewer,” that is to say, one who makes beer that others in his line of work are eager to consume. An avid outdoorsman, he recently released his first book, Malt: A Practical Guide from Field to Brewhouse (Brewers Publications). AAB: You’re just a big nerd when it comes to malt, aren’t you? Yes, I am. Yes, I am. Malt is so important for beer. People can get excited about hops, but somehow think malt plays a minor role. But it’s only the origin of all alcohol, body, color and a huge percentage of flavor. So, aside from that, why would you get excited about malt? That slight sarcasm aside, have you always been this passionate about malt? When I started off, my relationship with malt was that it was heavy. I carried it. So I thought I should learn more about it, and every time I learned something new, I learned that I could still learn more. Your brewery actually has a farm for growing malt, correct? Bell’s has a farm in Shepherd, MI, right middle of the state, and we’ve been growing barley there for five or six years. We grow it for malting, and we use it to make beer. And it’s been a great project. I’ve learned a ton about barley and a ton about malt, because you end up with all the problems of barley and malt. One example would be, and this is salient, if you get a late-season rainstorm, your grain can start to sprout while on the stalk. It’s something called pre-harvest sprouting. And it manifests itself by some grain growing on the stalk, and some is damaged. The whole point of growing is you try to make uniform. And you try to make homogeneous malt, and it doesn’t always respond in a homogeneous manner. So if it rains, the malt is not consistent, and it runs through brew house with difficulty. We’ve had this issue before, and it has impacted many brewers. So you have to watch the weather as well as make beer? The barley crop out west this year was not good. We had rain and snow when the barley was on the field, and some went through pre-harvest sprout issues. Ultimately, you can deal with it, but you need to know the levers to pull. Bell’s recently opened a second brewery and decided not to put it in North Carolina like so many others. Yeah, we stayed closer to home. That was important to us. It’s called the Upper Hand Brewery, and it’s in Michigan’s Upper Peninsula. I spent some time building it up, and we have some fantastic stuff there. I did the design work for the brewery and some development work on the physical side. This second brewery goes back to Larry and his deep roots in the U.P. Brewery founder Larry Bell, right? Yes. This is just a smaller production brewery, and this is very much different than what we do at Bell’s. The beers are different. We’re making three beers, and they are really nicely drinkable beers. It’s a different brand identity. The look and feel of it and the beers are different from what we make at Bell’s, but like those beers, they are very focused on quality. We wanted the beers that we’re making at the new brewery to be super drinkable, and they were designed to be enjoyed a couple at a time. Speaking of Bell’s, what’s the consumer question you get most often? Well, it’s complicated, but mostly these are special beers, and having them be seasonal is something we like and want to keep doing. You’ve been at this for a while. What’s changed overall in brewing since you started? Well, there were three large brewers. Now there are two. There were 40 small brewers, and now there’s something like 3,000. There was poor understanding of beer styles beyond regular and light. Beer, it shows up everywhere now; it shows up on The New Yorker cover. How has beer changed? There is an acceptance. The access to information is awesome these days. When I started, I didn’t have a personal computer, and there wasn’t an Internet like now. If you wanted to research something, you were doing it in a library. Or buying a Michael Jackson book to find out about these crazy esoteric beer styles that were out there. Before I started brewing, I was very interested in beer, and I’d hunt out these weird beers—go through package stores in Boston and find an odd beer, and then go home, taste it, take notes on what I thought it was, even without the vocabulary. I was doing it on my own. Later on, in my formal brewing years, I looked at those notes and realized that what I was tasting was oxidation. That’s interesting. What else did you discover? There just wasn’t the diversity there is now, and the diversity that was there wasn’t always particularly good. It’s a lot easier to get information these days then, yes? There’s a limitless access to information about beer, and I think that’s awesome. Go to the next page to learn more about John Mallett. When are you going to distribute to Oregon? I needs me some Hopslam!